When I was taking a couple of summer school classes during the first summer term, the first six weeks of the summer, I stayed at a place called "The House of Love." An ironically fitting name for a place occupied by five Seniors from APU, all guys, all perfect representations of various slices of the APU pie. I represented the theology-nerd side as well as I could, Ryan represented the ASB stud/psychology slice, Caleb represented the Art major/ hippie/ not-quite-a hippy-but-looks-like-one side of the APU world, Brandon... well he represented the Brandon slice of the pie, and Alex represented the sociology major/ doesn't-look-like-a hippy-but-is-one-indeed side. My experience at the House of Love was unforgettable, filled with enlightening conversations about life, love, theology and Guitar Hero... mostly Guitar Hero. But of everything we did in those six weeks, from harboring a criminal in our car port (ask me about Gregory again some time) to spending quality time and Brandon's money over a pitcher of BJ's beer, I enjoyed my conversations with Caleb on the back porch the most. Caleb is an extremely well read art major who would have made a very good theology major with how much he knows about the subject. 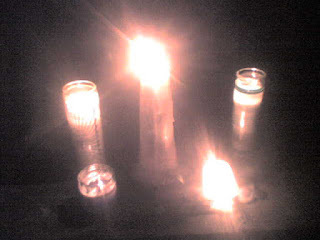 Every other evening or so Caleb and I, and maybe a couple others, would sit on the couches on the back porch and have a beer by the candle light (the candles weren't there as much for atmosphere as they were for lack of other lights due to a burnt out light bulb and too much laziness to change it). We talked about our experiences, mine as a theology guy, and his as an art guy. I began to realize how close knit art and theology are to one another. We shared similar passions and similar frustrations toward our disciplines and the world in general. He struggled with art in a similar way I was and still am struggling with theology. We both dealt with how people respond and will respond in the future to what we do and say - to our "message." Because theology, like art, is risky business. Theology and art are closely knit because theology's roots are in art, and at its deepest levels theology is art. The Bible is filled with Poetry perhaps because poetry and art is the only tool we have to get deeper than what we can observe and illustrate in propositions. The truth about God is a truth that can't be caged up, it can't be captured. God is not tamable, we can't define him in our most sophisticated terms, we can't domesticate Him. A God like this can't be captured in a photograph so perhaps a painting or a sculpture would be better. Maybe the truth about God is better experienced in beauty and irony. Maybe there are times when abstraction is more truthful and important than even the most exact documentation. This might be why there is so much abstraction, myth, and symbolism in the scriptures. Caleb helped me see that art is drenched in truth and has a message much sharper that anything you could ever hear on the news or the History Channel. I never had anticipated, when I was in art class freshman year, that by my senior year I would have been thinking of myself as an artist.